(15/P72) TRENTON – Wildlife experts with the New Jersey Division of Fish and Wildlife this morning successfully removed an arrow that has been protruding from the muzzle of a female deer that has been seen frequently in the Marlboro area since last winter. The wildlife experts, Kim Tinnes, Joseph Burke, and George Garbaravage, were able to attract the deer using corn placed at a private property off Suffolk Way in Marlboro. They tranquilized her with a dart gun. The wildlife experts snipped off the shaft but, upon the recommendation of a veterinarian on scene, left the arrowhead in place. The wound had healed around the arrowhead and trying to remove it could cause further injury, the veterinarian, an experienced wildlife rehabilitator, determined. Removal of the shaft will alleviate the risk of the deer becoming snagged on branches or other protruding objects, potentially causing the wound to open or any further internal damage. The doe, estimated to be at least three to four years old, appeared in good health and of normal weight and was released back into the wild with her fawn. Her prognosis for survival is very good. It’s not clear exactly how long the arrow had been lodged in the deer’s muzzle, but the Division of Fish and Wildlife was notified last December and made numerous attempts to tranquilize it over the winter. Those efforts were put on hold in May because the doe had become pregnant and there was a risk of harming the unborn fawn. Despite the arrow protruding from its muzzle, the doe had shown no signs of stress or weight loss and successfully gave birth to a fawn. At one point over the winter, biologists were able to hit the doe with a tranquilizing dart, but it fell out with no effect. 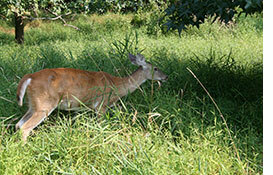 Tranquilizing wildlife under any conditions can pose a serious risk to any animal. The Division of Fish and Wildlife resumed its efforts to track and tranquilize the deer last week, with slightly cooler morning and evening temperatures that would put the doe at reduced risk of stress.